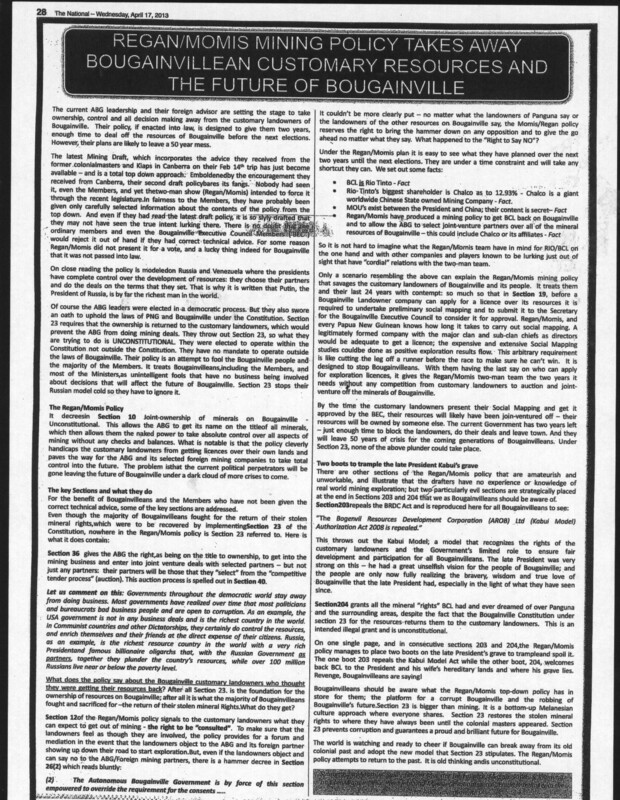 Written by two former Autonomous Bougainville Government (ABG) ministers the full page spread claims that Regan, along with ABG President, John Momis, have engineered a “top-down [mining]policy” that will “take ownership, control and all decision making away from the customary landowners of Bougainville”. Mining is a sensitive issue on Bougainville. The decade-long civil war that pounded the island during the 1990s, taking somewhere between 10,000 and 20,000 lives, was triggered by Rio Tinto’s mammoth copper and gold mine, which landowners accused of destroying their environment and fracturing Bougainville’s tightly knit communities. Given the intimate role Rio Tinto played in supporting brutal defence force operations during the war’s early years, the mining question to this day elicits a strong response on Bougainville. In this tense post-conflict environment, AusAID’s recent efforts to assist the island’s government to resolve the mining question have been anything but adept. It can now be revealed that one of Regan’s ABG co-advisors, Griffith University Professor Ciaran O’Faircheallaigh, has direct links with Rio Tinto, a company that stands to make a large financial windfall were the mine on Bougainville to reopen. Absent from this media release – pithily titled “Griffith academic negotiates a mine field” – is mention of O’Faircheallaigh's close association with the research project at the epicentre of a recent controversy involving Marcia Langton and her Boyer Lectures (“Poverty in the Midst of Plenty: Economic Empowerment, Wealth Creation and Industrial Reform for Sustainable Indigenous and Local Communities”). Along with Langton, O'Faircheallaigh is a chief investigator on the $480,000 study, which is part bankrolled by Santos ($45,000), Woodside ($30,000), and perhaps most controversially, given O’Faircheallaigh's role on Bougainville, Rio Tinto (Rio’s support is for an undisclosed amount, but on the project's website it is described as “substantial financial assistance”). It is worth adding that O’Faircheallaigh’s immediate employer Coffey International, who acts as an implementing service provider for AusAID, draws a large chunk of its revenue from the mining, oil and gas industry. Rio Tinto is one of Coffey’s major clients. These financial links between Rio Tinto and those operationalising AusAID’s programme on Bougainville, which are starting to be unravelled in the social media, are bound to be poorly received on the island. And it comes in a particularly tense period in Bougainville’s post conflict history, where AusAID-funded advisors are coming under sustained fire. Indeed, in February Anthony Regan was publicly rebuked in Papua New Guinea’s national press by former Bougainville Revolutionary Army commander Sam Kauona. Matters then deteriorated last week with the full page advertisement. One source of potential tension, recently highlighted on PNG Exposed, are the significant sums being paid to contract Regan’s services. In one instance, AusAID paid out $41,951.25 for a six week “Bougainville Strategy Review”. This is a surprising claim given that the latter legal challenge is built on a significant body of evidence, including affidavits from towering figures in PNG's political landscape, such as Michael Somare (former prime minister), John Momis (former minister, current ABG president) and Jerry Singirok (former commander of the PNG Defence Force). The testimony is corroborated by a large cache of internal BCL records. Yet this is not the only surprising statement Regan has made with respect to the Bougainville conflict. He has also employed curious methods to question the conflict’s death toll. One of the worst killers was the military blockade placed around Bougainville by the PNG government in May 1990. Nothing was allowed onto the island, not even humanitarian aid. Thus one scholar noted that it was stiffer – and more indefensible – than the sanctions placed on Saddam Hussein’s Iraq. The death toll ballooned accordingly; women and children fared worst. Using records kept by Bougainvillean medical staff, Lissa Evans, from Community Aid Abroad’s Disaster Response Desk suggested 3000 people died needlessly in 1990-1991 alone. Indeed the situation was so parlous that Médecins Sans Frontières publicly condemned the PNG government for letting civilians die. To my knowledge there is no method in the social sciences that would offset the general health “benefits” of forced work and exercise, against deaths resulting from the denial of medicines and surgical equipment. It is perhaps not surprising, in light of the above positions, that Regan's AusAID advisory role on Bougainville has been criticised by major power brokers on the island. Leaving aside that the Australian Government has ignored Rio Tinto's well-documented criminogenic role on Bougainville, this announcement is already inviting strong criticism by Bougainvilleans in popular social media forums. One Bougainvillean commentator reported, “If they want to study illegal miners on Bougainville there is no better place to start than with the illegal establishment of the Panguna Mine itself”, while another noted, “Bottom line, Australia, as always since colonial times, is only trying to protect its interest in Bougainville”. While this AusAID research project might indeed have laudable ends – the summaries provided thus far certainly suggest this may be the case – nevertheless, the study is almost certainly going to be politicised owing to the investigators' links and public position on the war. In this respect AusAID cannot ignore public perception on Bougainville, or for that matter in Australia. Strong feelings of injustice remain. And rather more palpably, from a security perspective, significant actors on Bougainville resent the enduring role Rio Tinto and the Australian Government play in the island’s political economy. Using Australian taxpayer dollars to fund advisors and organisations who are either linked with Rio Tinto or who have made divisive statements on the war, is not going to play well in this tense environment. Moreover, funding research into “illegal” mining by local alluvial prospectors is bound to prove similarly controversial while the likes of Rio Tinto, and indeed former Australian governments, escape formal scrutiny over their egregious role in the hostilities. Consequently, AusAID’s celebrated contribution to the peace process on Bougainville may well unravel and be forgotten, if it continues to fumble about much less capably with the mining question.